IISD RS has provided daily web coverage and a summary and analysis from this session. In order to download our report, kindly click the HTML/PDF icons below. 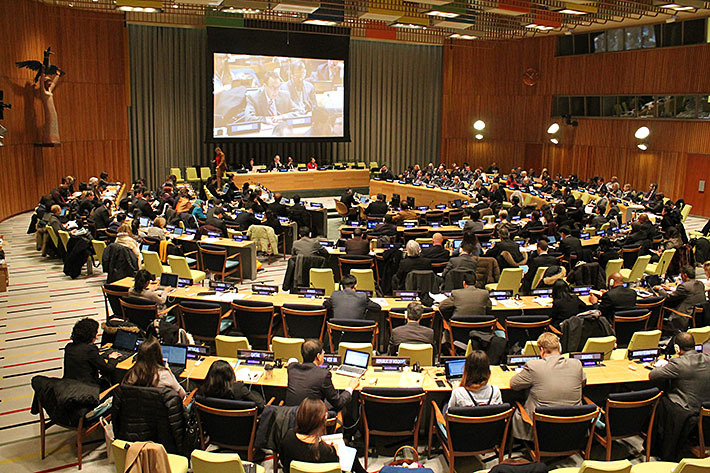 The first drafting session of the outcome document of the third International Conference on Financing for Development was held in New York, from 28-30 January 2015. The outcome document, expected to be negotiated and agreed at the third International Conference on Financing for Development from 13 to 16 July 2015 in Addis Ababa, Ethiopia, will constitute an important contribution to the implementation of the post-2015 development agenda. Two further drafting sessions are expected to take place in April and June 2015. The International Conference on Financing for Development is mandated by the General Assembly, in resolutions 68/204 and 68/279, to focus on, inter alia: assessing progress in the implementation of the Monterrey Consensus and the Doha Declaration; addressing new and emerging issues; and reinvigorating and strengthening the financing for development follow-up process. On its third and final day, the first drafting session of the outcome document of the third International Conference on Financing for Development discussed synergies with the post-2015 development agenda and other issues, and monitoring, data and follow up. The session on synergies was addressed by Ambassador David Donoghue, Permanent Representative of Ireland and Co-Facilitator of the post-2015 development agenda process; and Amina Mohammed, UN Secretary-General's Special Adviser on Post-2015 Development Planning. On Thursday, participants considered domestic and international private finance; international public finance; trade; technology, capacity building and innovation; sovereign debt; and systemic issues. Following a one-day delay caused by Snowstorm Juno, the first drafting session of the outcome document of the third International Conference on Financing for Development began at UN Headquarters in New York on Wednesday, 28 January 2015. For most of the day, delegates commented on an elements paper prepared by the Financing for Development Office (FfDO). In the afternoon, a discussion on domestic resource mobilization took place. Delegates reviewed documents before the session. Observers used their laptops on the gallery floor.